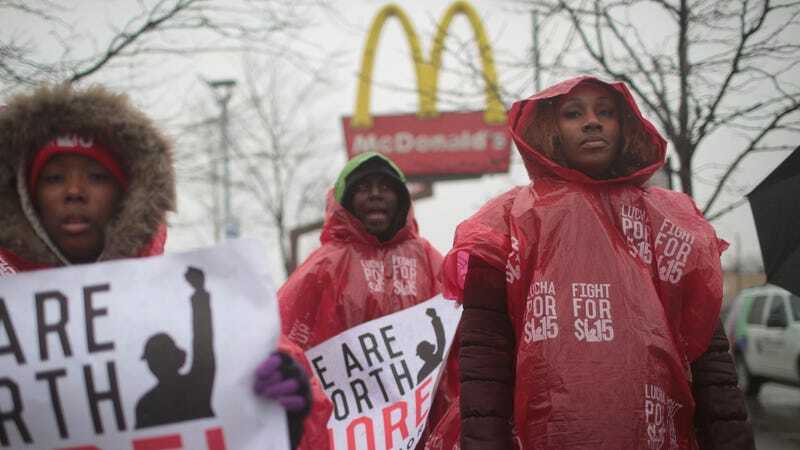 McDonalds workers and their supporters protest outside of a company-owned restaurant on April 3, 2018 in Chicago, Illinois. The allegations are troubling. A Durham, North Carolina manager is accused of proposing threesomes with employees. In Chicago, a manager allegedly described detailed accounts of “what he would do” if he got two employees alone with him in a bathroom. A 15-year-old employee of a St. Louis McDonald’s described her treatment there as “a nightmare.” When employees tried to bring these claims to light at their restaurants, Fight For $15 says they were mocked, ignored, or fired. Fight For $15 is also calling for mandatory company-wide training on sexual harassment and the creation of a more effective system for lodging complaints. According to the Chicago Tribune, Fight For $15 workers brought similar complaints to McDonald’s attention two years ago, and the company promised to review them. A company spokesperson declined to comment on whether those complaints led to any internal policy changes. The EEOC will now have to decide whether to bring a case against McDonald’s based on the civil-rights complaints filed with the office. If the EEOC declines to prosecute McDonald’s, the workers and Fight For $15 must ask the office for permission to file their own lawsuit. The complaint against McDonald’s indicates that the #metoo movement, which has had major repercussions across Hollywood and the restaurant industry, also is gaining ground among employees of more casual restaurants. “I know I’m not the only one and that’s why I’m speaking out, so others don’t have to face the harassment I’ve gone through,” the 15-year-old St. Louis McDonald’s employee, Breauna Morrow, told NRN.